We are proud to announce that TELEGRID has received ISO 9001:2008 Certification. ISO 9001:2008 is an international standard and is “based on a number of quality management principles including a strong customer focus, the motivation and implication of top management, the process approach and continual improvement. Using ISO 9001:2008 helps ensure that customers get consistent, good quality products and services,” (ISO website). TELEGRID is committed to providing its customers with products that consistently meet or exceed their requirements and expectations. TELEGRID will continue to improve its processes of design and development of new products and improvement of existing products. TELEGRID’s quality objectives are to improve its production processes to attain zero defects manufacturing and continue to meet or exceed agreed upon delivery times to 100% on-time-delivery. TELEGRID’s already strong quality management systems allowed it to achieve firm-wide ISO 9001:2008 certification in under 9 months. The SMRT was originally designed to monitor a large number of KIV-7M encryptors and display status changes and alarms on a single screen. With commands adopting HAIPE encryption as their new standard, TELEGRID was asked to incorporate the KG-250 and KG-175D into the SMRT. The goal of this effort was to create one common management system for a large number of different encryption devices. The SMRT’s intuitive design allows it to automatically monitor any device that has a web configuration tool, simplifying the addition of new devices. 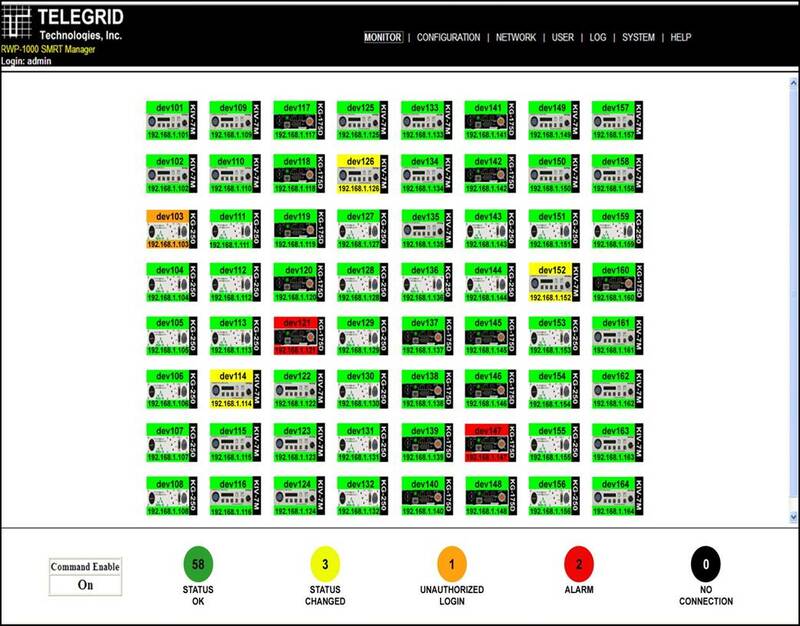 The SMRT display provides at-a-glance status indication of each individual device and allows operators to “drill down” to the web configuration screen of each individual device. Because SMRT utilizes the existing web configuration tools of these devices additional operator training is not necessary. Among the many benefits of the SMRT is its simplicity and ability to reduce the man-power needed to manage a large number of encryption devices thus providing a highly reliable network at significantly lower operating costs. For more information on the SMRT click here. TELEGRID invites you to visit us at AFCEA West, January 29-31, 2013 at the San Diego Convention Center. TELEGRID representatives will be on hand in BOOTH 1120 to demonstrate the SMRT and discuss its capabilities.